B2B vs B2C: What is the difference? B2B (Business to Business) content marketing is an entirely different ball game than B2C (Business to Consumer) content marketing, which is what most people are used to engaging with. B2B focuses on building professional relationships and giving your audience value. Contrary to popular belief, B2B content marketing is a more complex and elongated process, with the primary goal being to acquire new customers. B2C focuses on eliciting an emotional response from an audience. While the primary goal is also to acquire new customers, the B2C content marketing process is much simpler and therefore shorter in duration. Although there are differences between B2B and B2C content marketing, one similarity is the use of content marketing to generate leads or new business opportunities. Let's see how a B2B and B2C content marketing strategy might differ in today's world, and learn how to get started. The most important aspect of B2B content marketing is the need to build relationships with customers. Businesses are complex organizations that rely on a variety of factors to run smoothly, gain momentum and generate growth. It is inevitable that a cog in their machine may break down at any given time. That is where useful content comes in. As a business, create content that solves a problem, addresses a specific problem, and/or provides examples of best practices supported by data. Obviously, since there are two businesses in any B2B transaction, issues are twice as likely to arise, and so, communication is key to navigate through any bottleneck. Use content to be transparent and show yourself as a trustworthy figure who is easy to engage with. Fluffy, emotional, impersonal marketing campaigns are not as effective in the B2B space. You need to know your customers inside out: what their pain points are, how they operate, and how your solution can help. In 2015, Gartner released a statistic stating that by 2018, companies that have “fully invested in all types of personalization” will outsell companies that have not by 20 percent. By personalizing your communications, it enables your brand to connect with your audience in a human way. A company can have developed a phenomenal product that is miles ahead of your competitors, but that isn’t going to guarantee sales. It is important to remember that you must sell your product by tailoring it to each individual. As you may know, there is more communication required to secure sales in a B2B environment. Often, you will be expected to sell a product multiple times over, as you navigate the chain of command until someone with decision making power gives the go ahead. When it comes down to it, it can be challenging to navigate relative to B2C, but the long-term investment does provide stability and will have a bigger impact on your business. In a B2C environment, even though relying on manipulating emotions to secure sales is common, the entire process is mass communicated and therefore largely impersonal. It is only with the advancement of artificial intelligence that B2C companies can send emails and messages to their customers that are in any way personalized. Not only is the customer passive but generally, they are looking to satisfy their needs instantly. Therefore, unlike B2B, businesses needed to streamline the buying process. Amazon’s retail division has this mastered when the introduced the “1-click buy”. Successful B2C organizations understand that consumers want instant gratification and the quicker they can deliver on their product or service the better. B2C companies exist in extremely competitive environments and have to work to whittle away at margins continually. This means that if you are to thrive in their sphere, your content needs to draw in a lot of customers to stay in the race. As we learned above, B2B may only have a handful of clients and be a very lucrative business. They generally make more profit per product or service they deliver. Think about it; these companies have to research every customer they are dealing with and make a case for how collaborating with their products and services will improve their potential customer’s performance. Imagine if McDonald's had to operate in the same way, it would be infeasible to hand over happy meals at their current price. 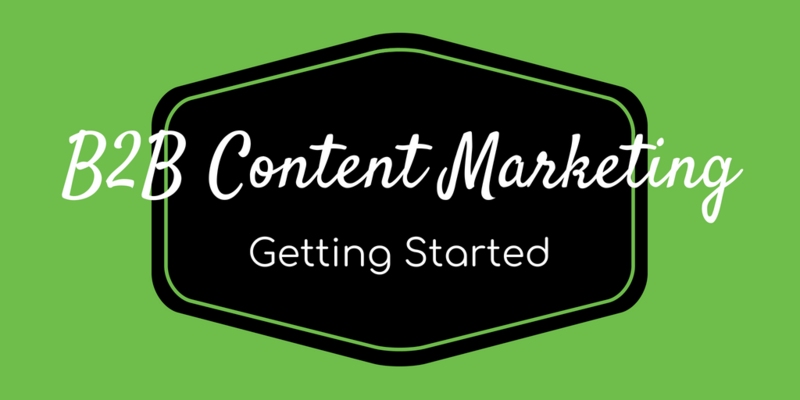 Content Marketing is no longer just about pushing content and/or keyword stuffing. It is a much more complex endeavour. You need to use data to make sense of your customers’ activity. Although the relevance of specific metrics may differ for B2B and B2C, having access to actionable data is invaluable to generating conversions from your content marketing. You need quality data to achieve success in your content marketing efforts. So now you’ve got an idea of some of the characteristics in a B2B and B2C environment. Start researching; this is unanimous. However, in a B2B environment you’re going to need to go more in depth and gather some detailed information about your audience. This will be your persona. Simply put, failing to do research is not setting yourself up for success. Using your research, develop a plan that enables your business to provide value for the persona you discovered. From a content perspective, determine which topics you feel your solution (or product) compliment, and brainstorm potential content topics to start developing. Now that your plan is in place, it is time to execute. Establish a roll-out plan that you and your team are comfortable with, that will allow you to prioritize your B2B content marketing plan. Ensure your content is personalized, and optimized for conversions. Artificial Intelligence can be your best friend when it comes to personalizing content. By collaborating with other brands, you're able to establish additional authority and reach audiences you may not have otherwise reached. Regardless of whether you are a B2B or B2C business, your content marketing strategy will be successful if you lay a good foundation.